I’ve been meaning to get going on some electronics projects for a while, and I’m about to pull the trigger on this one. A while back I posted a note about this project, and now I’ve got a new PCB coming out soon. This was a wired prototype for my bluetooth serial board. It’s damn hard to solder this stuff! Those are single strands from some speaker wire I pulled apart – and they worked. 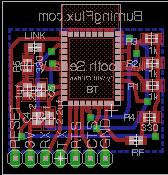 This is the new board for the Bluetooth serial interface. It should be a handy breakout for various projects. I decided against a shield, simply because it would be excessive for the few pins needed to make this work. I’ll probably be assembling these on demand, but I’ll be happy to sell bare boards to those that want to face surface mount. More later once the new board is past pre-production testing. « Netscreen 5gt: best home firewall for the money?